Most people in the states heard about George Carlin, and it’s likely that they even have listen to some of his stuff. I had too, but I never really passed beyond few dirty words jokes. Those are somewhat funny, but nothing to write home about. Then I got a bit more of his stuff when I was checking references in Zeitgeist Movie. Wow, there is some serious and really deep stuff, open minded critical thinking mixed with cynical humor. So I dig deeper. It turns out there is tons of his videos are available on youtube and google video. 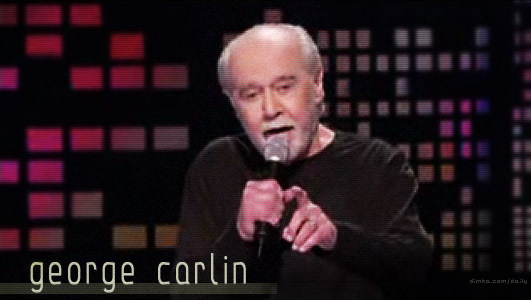 you can of course go to georgecarlin.com and order his entire work retrospective on dvd too.